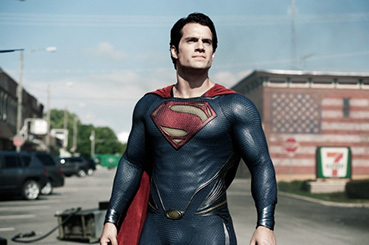 Hugely anticipated, Zach Snyder's MAN OF STEEL, flies into cinemas this weekend. With Christopher Nolan behind the scenes, will a brooding, anguished hero emerge and will we all have to kneel before Zod? asks Camus. it was the way we wanted to do it. It was fun to do." Pinewood Studios held an Open Day in 1977. I was up early that morning and could hardy stop trembling with excitement. Consequently, the first movie set I ever visited was the famous 007 stage. It was then (and perhaps still is) the largest film stage in the world first built for the submarine storage bay of the tanker Liparus in the Bond movie The Spy Who Loved Me. It was absolutely huge and, thirty-six years ago, not a single square foot was free from white polystyrene. My father was unimpressed. "It's all fake, it's just polystyrene..." he said. He saw polystyrene. I saw ice, ice that collectively was Superman's Fortress of Solitude (or what I imagined it may look like once director Richard Donner had managed to finish his own epic take on the man of steel). So the character and modern movie mythos of Superman and I are linked by powerful memories and Christopher Reeve's tremendous and vulnerable portrayal of the alien Kal-El despite the curious tonal mismatch between an all too real Superman and a ludicrously camp villain. Donner went to such great lengths to make everything 'real' and then directed Gene Hackman and henchman Ned Beatty as if they were on a Vaudeville stage. That clash of styles always bothered me. No matter. So, do we want 'real', a 2013 'first alien on Earth' story told with portentous rigour? Hullo Mr. Nolan and Mr. Snyder. As ever, the trailers look terrific. So, does Man Of Steel, so to speak, fly? Well, what do you think? A lot of 'yes' and a little if significant 'no' make up the bulk of both my 'knee jerk post screening' and 'reasoned hours later' responses*. Nearly every aspect of this take on Krypton's favourite Kansas farmboy is spot on; the explanation for all the hokey stuff, the note-perfect actor to character fit (Costner as Clark's Earth farmer father is a small stroke of casting genius), the astonishing effects, the knowing but not cloyingly referential nods to its own mythology, the non-reliance of decisions made by the bloody President (never seen, hardly mentioned, hurrah), its nonlinearity and its inherent trust in its own manifold subtext. And unusually, almost all of the secondary cast is well known to me from other favourite TV or film work so that was in a sense, comforting. The one aspect that let the side down was probably one of the only reasons the movie got green lit in the first place. I'll go into this in some detail a little further down the inventory of appreciation. Starring in more ways than one is the element that flies higher than every other aspect – Henry Cavill as the super man himself. Superhuman humility is a tough ask for any actor and the film was never less than hugely entertaining while Cavill was on screen. Even in bearded grunge mode, eking a living doing odd jobs, Cavill is never less than absorbing. I could have watched an entire movie of this character mooching from one physical labourer's job to another saving lives as he went. His super credentials have to come to the fore (I mean he has to get into the suit somehow) but while he was posing as human, the movie reeled, skipped and danced while promising so much. It was like watching an extended trailer knowing that satisfaction is minutes not months away. It's hard to believe that Cavill played Sienna Miller's love interest in the delightful Stardust, bested by the mere threat of a real sword fight from the hero Tristam and at the end being flirted at by Robert De Niro. Just goes to show what a gym regimen can do for you not to mention a change of hair colour. 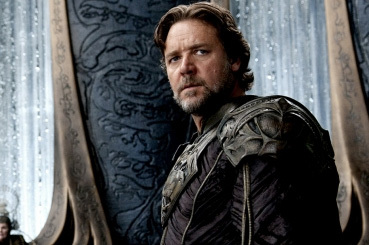 We start on Krypton where Snyder seems to have absorbed some Avatar DNA and has Superman's father Jor-El (a noble Russell Crowe) jumping on and off one assumes the Kryptonian equivalent of horses (CGI Thestral-like beings). He's determined that his natural born son will be rocketed away for safe keeping while two threats face his home planet – imminent destruction due to core instability and a loony military sort and his minions, all of whom are encased in jelly and their ship deposited into a black hole. There is a cute design nod to the Donner 'triangle' that ensnared the villains of the 70s sequel. So off the baby flies to Earth. Clark grows up in a state of perpetual identity crisis and through ingenious nonlinear story-telling, we're not stuck in Kansas for the second half hour. Lois Lane gets on the scent and before you can say "Kneel! ", the ex-black holed General Zod (an imposing and malevolent Michael Shannon) appears and essentially says "Give up Kal-El and then I will destroy the world..." There's a lot of technobabble about gravity wells and terraforming etc and tech that enables a dead, holographic father to play a fair share in the drama, but you can just about follow the basic narrative. There aren't many surprises except the odd clever line here and there but if there is a standout side of the film that's not perfectly muscled and ripped and wearing a very snug costume, its Snyder's (or writer David Goyer's) afore mentioned editorial decision to throw linear storytelling out of the window. We learn about Kal-El's past as he lives his adult life and you are never in any doubt which timeframe you're in. I found this hugely satisfying not simply checking the boxes as the movie grows up with the bullied child Clark, a child unable to strike back at his tormentors for fear of the early discovery of his powers. The past snippets had more weight this way and more dramatic oomph. This style of presentation also allows for some ingenious editing in terms of ideas and visuals throughout the running time. Before I plough into the ground (churning up the asphalt as supermen and women are wont to do) and reveal the aspect that disappointed me, let me just qualify my opinion with a simple truth and a single analogy. There is no question that I am decades older than the targeted demographic. I accept this and gave my 16-year-old son's opinion probably more weight than mine in the grand scheme of things. While on reflection, he agreed with a small part of my misgivings, he still rated the overall film very highly. So that's a good thing, right? My problem was (of all things in an action movie) the action. If you've seen the 1978 Donner version, you will no doubt remember one special effect that was far from special. It's the teenage Clark racing the train. I believe the actor was pulled that quickly on wires and then moved his legs as fast as he could as the camera was under-cranked to speed up the action. Whichever way you look at it, the effect is absurd. We have no real world reference for any human or indeed alien humanoid moving that fast so it lurches into farce. A problem with the technology available today (or unimportant issue, depends which side you're looking from) is that we can 'realistically' show a man moving super fast. With enough motion blur and semi-realistic intercutting with the actual human actor, digital effects and digital doubles become largely acceptable in the presentation of rapid action. So in a film constrained by 70s SFX technology, we had the odd FX blip but the movie had an abundance of heart nonetheless. Now VFX can make the ludicrous believable and the heart is still there no question but we have reached the "Just because we can, does it mean we should?" point, a question posed in (of all films) Jurassic Park. Snyder and company seem to be entrenched in the 'can' camp and those in the 'should' camp can go and take a flying leap (with accompanying sonic boom). 'Awesome' the action may well be to the average teen (it hurts committing that over-used adjective to this review but that's the word du jour) but even teenagers can suffer from overkill, can't they? In Donner's classic, Superman flying up to catch Lois and then the helicopter all seemed real because of smart editing. Its pace was dictated by what was actually possible in terms of effects in the late 70s. Now we have a plethora of digital expertise and anything goes and in Man Of Steel's case, everything goes. And goes. And goes. And then goes a little more. There is a forty-minute chunk in the second half of the film that feels like one super-punch after another, crashing through one wall after another ad nauseam. The level of care and detail observed is never less than stunning. I just question the wisdom of smash-bang-wallop after smash-bang-wallop to the point where you are so inured of the action, you're almost sighing with relief when it sneakily pretends to be over. This stuff is supposed to be thrilling but the digital double syndrome demotes it to mere shattering spectacle and at many times, confused spectacle. I'm sure after a fourth viewing I'd be able to make sense of the featured spacecraft but after one viewing I was not able to differentiate between Zod's mothership and a scout ship or a double terraforming ship etc. I chalked this up to my own inability to keep hardware straight in my mind and partially to the exuberance of the filmmakers. The action won't translate well to a smaller TV sized screen either because in a great many instances, to capture the scale of the events, Superman is more often than not a dot whizzing around like a blue-clad fly. High definition will help but heaven help anyone watching this on VHS or is that format now officially confined to history? Lost in the updating of the character (and I think correctly, creatively speaking) was John Williams' 70s iconic main theme. Oh, it's just wonderful but as a powerful memory. It wholly belongs with Donner's movie. Brian Singer's 2007 reboot, slathered with Williams' original score, was slavishly faithful to Donner's vision and he paid for that with a perceived underperforming feature (it made 400 million but was absurdly expensive to make and market), one that deserved more positive attention than it got despite some awkward casting. Snyder and company have swept that one off the table and started from scratch but not in an self-conscious 'modern' rehash of events and relationships we've already seen countless times before. Hans (Mr. Ubiquitous) Zimmer is a talented movie composer, no question. I have listened to his Deluxe version of his Man Of Steel score over and over for a few days and while it fits snuggly in the 2013 style of film composition, it's still a giant wall of audio for the most part with the subtlety of a supervised demolition. You sense there's control but it's often lost in the bangs and crashes. There is a theme in there, a four note piano piece which speeded up reminded me of Goldsmith's exuberant score for Hoosiers (or Best Shot as it was known in the UK). Does it lend Man Of Steel gravitas? In spades. But in the action scenes, it's mallet-like in its pounding insistence. In the quieter moments and those led by character rather than spectacle, it's a real treat, a slow beating heart in the Kansas countryside. Dare I suggest the final images of the film are strangely moving, music and images enhancing each other effortlessly. If only the entire film had weaved that same spell instead of opting to showcase a glut of hyper violence and destruction. In conclusion, everything in Man Of Steel is new in most respects but that action quotient is way too high. It's like settling down to a meal. The prawn starter is sublime. The main course side dishes are works of culinary art themselves and the main dish, lamb chops in rosemary and garlic, the fat both crunchy and juicy, is cooked to perfection. So what's the problem? There are fifty-eight lamb chops. Throw a tiramisu at me after the main course and I will not care one jot. It's not just that there is too much action, it's that this action damages the terrific movie that lurks beneath it. I'd pay good money for a Blu-ray of Man Of Steel if we could go back and re-cut it... Blasphemy! No, just seeing with older eyes perhaps. * I was smacked of gob, after I wrote the first drafts of this review, to find Mark Kermode on the BBC website in such complete agreement that I almost felt like he had been looking over my shoulder. This synchronicity adds weight to my argument though to be fair, both Kermode and I are of a certain age. We obviously can't handle action the way we used to. Are those my slippers?